^ Hollis, T.; Bedding, J. (1994). 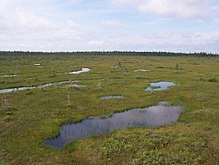 "Can we stop the wetlands from drying up?". New Scientist. (Subscription required (help)). ^ Richardson, J. L.; Arndt, J. L.; Montgomery, J. A. (2001). "Hydrology of wetland and related soils". In Richardson, J. L.; Vepraskas, M. J. Wetland Soils. Boca Raton, FL: Lewis Publishers. ^ Ponnamperuma, F. N. (1972). The chemistry of submerged soils. Advances in Agronomy. 24. pp. 29���96. doi:10.1016/S0065-2113(08)60633-1. ISBN 9780120007240. ^ Mazzotti, F.J.; Best, G.R. ; Brandt, L.A.; Cherkiss, M.S. ; Jeffery, B.M. ; Rice, K.G. (2009). "Alligators and crocodiles as indicators for restoration of Everglades ecosystems". Ecological Indicators 9(6). 9 (6): S137−S149. doi:10.1016/j.ecolind.2008.06.008. ^ Invertebrates in freshwater wetlands of North America : ecology and management. Batzer, Darold P., Rader, Russell Ben., Wissinger, Scott A. New York: Wiley. 1999. ISBN 978-0471292586. OCLC 39747651. ^ Brix, H (1993). "Wastewater treatment in constructed wetlands: system design, removal processes, and treatment performance". In Moshiri, A. G. Constructed Wetlands for Water Quality Improvement. Boca Raton, FL: CRC Press. ^ Moseman-Valtierra, S. (2012). "Chapter 1: Reconsidering the climatic roles of marshes: Are they sinks or sources of greenhouse gases?". In Abreu, D. C.; Borbón, S. L. Marshes: Ecology, Management and Conservation. New York, NY: Nova Science. ^ Finlay, Jacques C.; Efi Foufoula-Georgiou; Dolph, Christine L.; Hansen, Amy T. (February 2018). "Contribution of wetlands to nitrate removal at the watershed scale". Nature Geoscience. 11 (2): 127–132. doi:10.1038/s41561-017-0056-6. ISSN 1752-0908. ^ Hansen, Amy T.; Dolph, Christine L.; Foufoula-Georgiou, Efi; Finlay, Jacques C. (2018-01-29). "Contribution of wetlands to nitrate removal at the watershed scale". Nature Geoscience. 11 (2): 127–132. doi:10.1038/s41561-017-0056-6. ISSN 1752-0894. ^ Kelman Wieder, R.; Lang, GeraldE. (November 1984). "Influence of wetlands and coal mining on stream water chemistry". Water, Air, and Soil Pollution. 23 (4). doi:10.1007/bf00284734. ISSN 0049-6979.